Rosh Hashana is one of the most important days in the Jewish calendar. On this day, we welcome the New Year and wish for a good, happy and fruitful year. A New Year makes us more optimistic, as we feel that a door is opened, a door that welcomes new opportunities, new directions, new hopes. We can walk through this door and move forward in a new way, a hopeful way, and a fearless way. During the previous month named Elul we examined our deeds throughout the year that had passed, and now we are ready for a better, more promising year. The name Rosh Hashana (רֹאשׁ הַשָּׁנָה) is composed of two words: Rosh (רֹאשׁ) which means “head” and Shana (שָׁנָה) which means year. Hence, Rosh Hashana means the beginning or the head of the year. 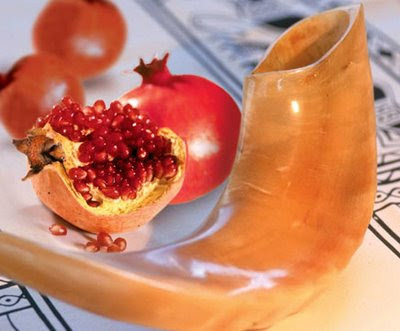 The name "Rosh Hashanah" is not mentioned in the Bible - it refers to the holiday as Yom Ha-Zikkaron (the day of remembrance) or Yom Teru'ah (the day of the sounding of the shofar - a ram's horn which is blown somewhat like a trumpet). Rosh Hashana falls on the first and second days of the month of Tishrey. In the secular year of 2011 it begins on September 28 at sundown and ends on September 30 at nightfall. It is a custom to wish “Shana Tova” (שָׁנָה טוֹבָה, Good year) in the days before Rosh Hashana. This is a wonderful opportunity for us to wish you a wonderful year, a year of health and happiness, a year of achieving your goals and creating new ones.